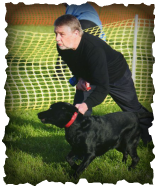 Lynne joined Fylde Coasters Flyball Team in 2005 with Millie the Labrador. Then along came Alfie, Border Collie and Indie, JRT. Millie and Alfie just competed in Starters neither of them being very fast but always reliable. 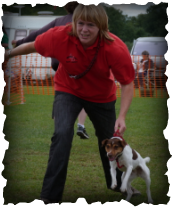 Indie, however, was born to do Flyball and loves every minute. She is now in Sanctioned and has achieved her Intermediate Award in 2015. This is Pete racing with Millie who is sadly no longer with us.